A report released early this month by the U.S. Geological Survey indicates that the water level in a confined aquifer in the southern Wood River Valley continues to decline, though causes of the decline have yet to be determined. Two measurements taken at each of 10 wells in the aquifer, one in 2006 and the other in 2012, showed declines of between one-tenth of a foot and more than 20 feet; average decline was 6.8 feet. According to the report, titled “Stream Seepage and Groundwater Levels, Wood River Valley, South-Central Idaho, 2012–13,” the Wood River Valley aquifer system is composed of a single unconfined aquifer that underlies the entire valley and a lower, separated and confined aquifer in the southern Bellevue fan, generally to the south of Baseline Road. Average decline of 77 wells measured in the unconfined aquifer was 2.9 feet, though some had declined as much as 14 feet. Bartolino cautioned that measurements were taken only twice, six years apart, and no one knows what went on in the meantime. A groundwater flow model of the Big Wood River system, scheduled for completion at the end of 2015, is expected to provide hydrologists with the tools to answer that and related questions. The recently compiled data will be included in the model. Bartolino said farmers in the southern Bellevue Triangle are “fairly dependent” on the confined aquifer. He said there appears to be some recharge of the confined aquifer from the larger, unconfined aquifer, though hydrologists do not yet have detailed knowledge of how they are connected. He said longtime residents in southern Blaine County have reported that there used to be a lot of water-logged land north of U.S. Highway 20, but those areas have been gradually contracting southward. Bartolino said flows in the Big Wood River have also been declining, and that seems to tie in to a lower groundwater level. 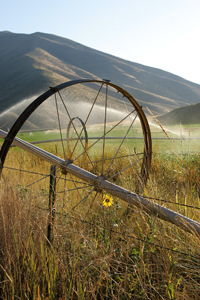 The groundwater flow model, a collaborative effort between the U.S. Geological Survey and the Idaho Department of Water Resources, will be used for combined administration of groundwater and surface water rights.